Die adjustment strike, weak strike, low pressure strike or touch strike are all names for this type of error struck with low tonnage pressure on the coin press. Low pressure strikes are either from a malfunction of the press or technicians testing striking pressures when setting up the coin press. I guesstimate the striking pressure on this error coin is approx. 10 tonnes compared to 120 tonnes of pressure to obtain a regular struck coin. 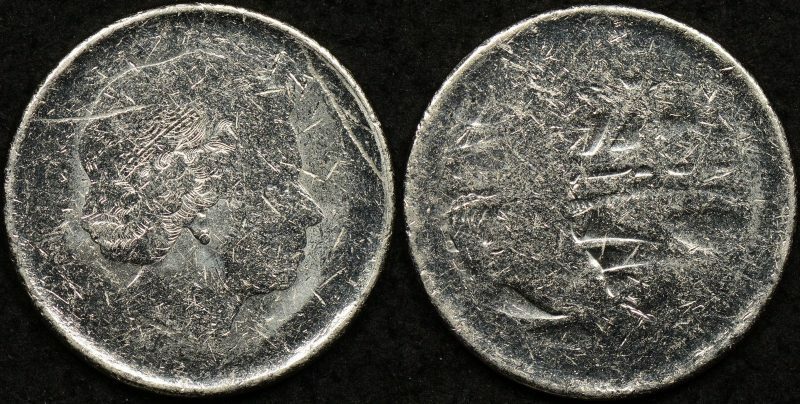 The “chatter” over the coin is due to the low striking pressure, it has not evened out any marks originally on the planchet. Read more about low pressure strikes. Or see an example of a 20c touch strike series. Supplied in an archival Saflip.